28 years ago Brad Carter (Reidsville) clocked a 2:28.04 1000 to set a North Carolina State Record that held up for a long time. Two athletes came into the VA Showcase with a legitimate shot at the North Carolina State record in Cameron Ponder (Mt. Tabor) and Ian Delgado (Green Hope). Ponder had run 2:31.22 earlier this season and Delgado 2:30.40 last Friday. The race was set up for a fast time with studs like Josh Hoey (PA), Dalton Hengst (MD) and Brodey Hasty (TN). The race went out and through 200 meters Ponder and Delgado both were around 5th going through 200 and around 29 seconds, though it's on pace the 1000 normally goes out a little faster. They went through 400 in 59. Ponder, with his eyes set on a state record time took over the lead hoping to pick up the pace. Hoey, Delgado, Hasty and Hengst all followed the new tempo. Ponder led through about 700 meters until he was overtaken by Hoey and sat just behind him with Delgado on his shoulder. Ponder was then passed by Delgado and Hengst and was hanging on for fourth beyond the bell lap. With 100 meters to go with Hoey and Hengst battling for the win, Ponder surged past Delgado putting himself into 3rd. Ponder was caught by Hasty as they crossed the line and took 4th overall. But the main goal of achieving the North Carolina 1000 State Record was on his mind as he look at the scoreboard. 2:27.37 was Ponder's official time with Delgado just behind in 2:28.19. The marks will be good for a new State Record for Ponder and NC#3 All-Time for Delgado. Ponder wished he could have won the race, but said he was happy to earn the state 1000m record. Ponder will go after former teammate Kenny Kneisel's Indoor Mile State Record in 2 weeks at Camel City Elite against a Pro field at JDL Fast Track. 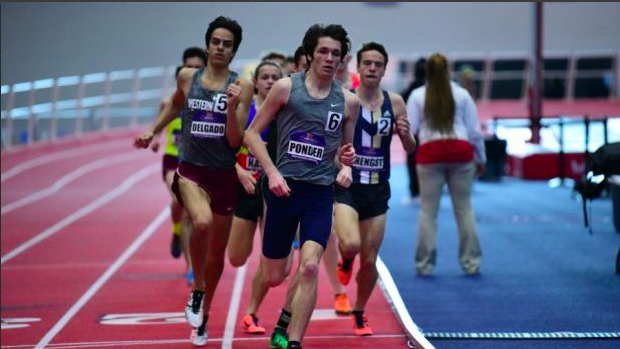 The new 1000m state record isn't safe to stand at 2:27.37 through the 2018 season, as Ponder and Delgado both will run the 1000 at least one more time this indoor season.